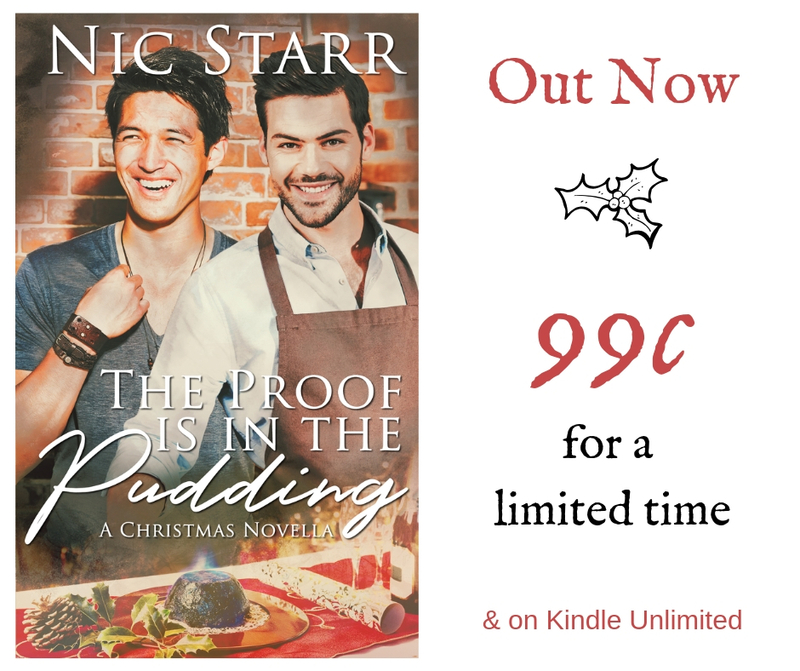 christmas | Because two men are better than one! Thanks very much for having us back, Nic & RJ! Irene and I are excited to be sharing our upcoming release, Bonfire, with your readers. For this post, we thought we’d talk about some of the behind-the-scenes thinking that led to our new story. See, Bonfire picks up a couple months after our first book Vespers left off, and takes Thaddeus and Sarasija through the holiday season. The decision isn’t as strange as it might seem. Thaddeus Dupont is a vampire, but he’s also a good Catholic boy, which obviously has all kinds of associated traditions. There are also vibrant holiday customs associated with our Louisiana bayou setting. From holiday carols to the Christmas Eve bonfires on the levee that give the story its name, we had plenty to work with. Writing a novella gave us the chance to show Thaddeus and Sara as a couple, and setting the story during the holidays provided a way of framing their growing pains. Sara’s secular Christmas traditions are quite different that Thad’s, and the way they negotiate their distinct ways of celebrating represents how they work through other issues. If we’d only focused on the relationship though, things could have gotten a little angsty. We didn’t want that (because holidays! ), so we gave Thad and Sara a mystery to solve. There’s a definite spook-factor attached to chasing mysterious lights around the swamp at night, but there’s not nearly as much mayhem in Bonfire as there was in Vespers. Nohea is missing, too. She was such a key part of Vespers, but she doesn’t live at Thad’s house on the river, so she’s not part of everyday life there. She’s also a little (or a lot) frustrated with her vampire-boss as a result of events in Vespers. Until they work things out – which’ll happen in book 2 – she’s making herself scarce. She’s not completely invisible in Bonfire, but she’s not on the page at all. And yeah, I totally just talked about one of my characters as if they’re a real person. You should try being in my head sometimes. It really is that confusing. Bonfire’s a little bit lighter than Vespers, but it carries over some important elements, namely how our two heroes relate to each other and how their beliefs influence their behavior. There’s heat, and there’s humor, and there’s eight tiny alligators pulling Santa’s sleigh. And you know, Thaddeus and Sara might have defeated the Big Bad in book 1, but Weyer’s Praestigiis Daemonum is still out there somewhere, and depending on who gets ahold of it, all hell could very well break loose. Prize pack includes $20 Gift Card to Amazon, Barnes and Noble, or AllRomanceEbooks. This holiday novella can be enjoyed alone or as book 1.5 of the Hours of the Night Series. Bonfiretakes place the December after the events in Vespers. Dorothy ran Pinky’s, a small sundries store with a restaurant in back, the only place to buy groceries within ten miles. In her day, she’d been widely acknowledged for her beauty, though I had always respected her for her intelligence and wit. If she recognized the similarities between me and the Mr. Dupont who’d lived in the River house when she was a girl, she’d never mentioned it. We had an accord, Dorothy and I, one I would be reluctant to break. While the phone was ringing, I noticed two paper shopping bags in the corner of the room. The phone had just enough cord for me to reach the closest bag, but before I could open it, Dorothy answered. “I guess you got my message.” Dorothy sounded annoyed, as if she’d rather I hadn’t called. “Yes. What can I do for you?” I opened the bag and lifted out a glossy black box. Christmas lights. Surprised, I bit my lip against a sharp surge of irritation. Confused, I set aside the first box and lifted out another. “Lights?” More lights? I lifted a third and then a fourth box of Christmas lights out of the bag. “And what has this to do with me?” Fueled by exasperation, my tone was sharper than normal, but what was Sara thinking? A single ornament was one thing, but I never decorated for the holidays, especially with multicolored, LED, synchronized flashers. Sara wandered out of the kitchen, his smile brightening when he saw I’d discovered his secret. “Things will die down. They always do.” I knew that from experience. As a solitary man who kept to himself, I periodically came under scrutiny from the neighborhood. There would be talk, and the bravest would come down the river to my house and poke around. My assistant, or maybe Mayette, would allay their fears, and the next good bit of gossip would distract them. She thanked me, grudgingly, and ended the call. I hung up slowly, considering the best approach to take. “You’re crazy.” He ducked, hiding behind a shield of hair.